Discussion in 'Kingdoms General' started by BarryX15, December 26, 2014. If you are going to start a new town, be sure to check /t list for updated list of already existing towns and then double check the distance from each town by /t distance townname. Remember that 1000 blocks is a reasonable minimum but 1500 to 2000 blocks would be better to have some distance for future expansion. The outer/lighter circle represents new world border after expansion to 8k blocks radius. 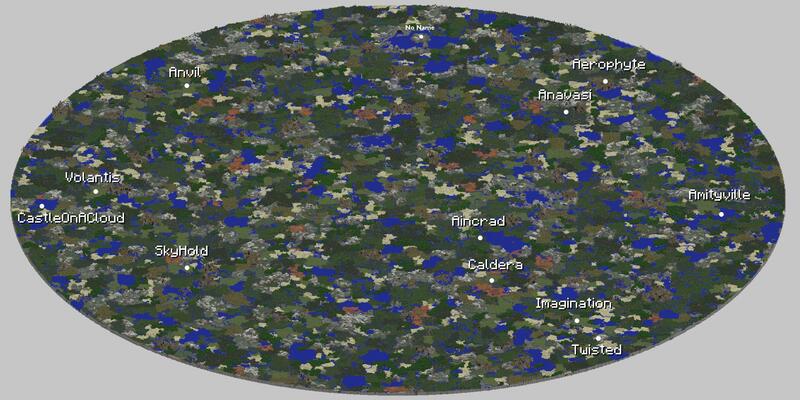 The inner/darker circle represents old world border with 6k blocks radius as we had just after the map reset. The big light rectangle in the middle represents the Capital area. White lines are capital roads, highways (thick), roads (lines) and paths (dotted lines). tOPIV, gonemadd, Smartness and 28 others like this. any chance you can put a dot for an area that is being developed for towns, or no? just take this picture, draw your desired place and upload it. EDIT: it does NOT guarantee you that nobody else will start a town on the same place before you. melvin484 and BarryX15 like this. Thanks Barry, this is really usefull! Off the radar. You're all jealous. Not sure if I missed it but is there any reason as to why the towns Marathon, Avila, and Whiterun are in black not white? Or is that just for clarity? How often does the map get updated? Whenever i want to update it There is no strict schedule. Updated again, now with bigger map coverage, town ranks and kingdom colors. Should i keep deleted town locations on the map? Sephronia, dogwatch, dannyotis13 and 3 others like this. I think over time it would become quite cluttered with the non-existent towns so removing them sounds good to me. I like the idea of keeping the non-existent towns on the map until another town claims over it or in the vicinity of it. BarryX15 and Wilven like this. Yeah actually that makes sense. Maybe have them in like a greyed out colour or something. Also with all these colours now it would be great if there was a key so we could tell which Kingdom is which.